The images shown below were created from the COBE DIRBE data products . The colors generally do not map linearly into sky brightness. Use the original data products for quantitative analysis. Additional images are available in the COBE Slide Set. 1.25, 2.2, and 3.5 micron Solar elongation angle = 90 deg Maps - Galactic coordinate Mollweide projection maps of the entire sky as seen by the DIRBE at a fixed angle relative to the Sun. Stars concentrated in the Galactic plane (horizontal feature) dominate the images at these wavelengths. Dust in the Milky Way absorbs and scatters starlight, producing the dark band that runs through the Galactic center in the 1.25 micron image; this "extinction" effect diminishes with increasing wavelength. False-color image of the near-infrared sky as seen by the DIRBE. Data at 1.25, 2.2, and 3.5 µm wavelengths are represented respectively as blue, green and red colors. The image is presented in Galactic coordinates, with the plane of the Milky Way Galaxy horizontal across the middle and the Galactic center at the center. The dominant sources of light at these wavelengths are stars within our Galaxy. The image shows both the thin disk and central bulge populations of stars in our spiral galaxy. Our Sun, much closer to us than any other star, lies in the disk (which is why the disk appears edge-on to us) at a distance of about 28,000 light years from the center. The image is redder in directions where there is more dust between the stars absorbing starlight from distant stars. This absorption is so strong at visible wavelengths that the central part of the Milky Way cannot be seen. DIRBE data will facilitate studies of the content, energetics and large scale structure of the Galaxy, as well as the nature and distribution of dust within the Solar System. The data also will be studied for evidence of a faint, uniform infrared background, the residual radiation from the first stars and galaxies formed following the Big Bang. For more information about the Milky Way at wavelengths ranging across the entire electromagnetic spectrum, see the Multiwavelength Milky Way web site. 4.9, 12, 25, and 60 micron Solar elongation angle = 90 deg Maps - Thermal emission from star-heated dust in the Milky Way and interplanetary dust heated by the Sun dominates the images at these wavelengths. The S-shaped feature is the ecliptic plane, in which, like the planets, the interplanetary dust is concentrated. The oval-shaped brightness discontinuity is an artefact of the way the maps were prepared, not a feature in the infrared sky. Specifically, the discontinuity corresponds to a path difference through the interplanetary dust cloud as adjacent positions in the sky were observed from DIRBE's vantage point in Earth orbit with the Earth on opposite sides of the Sun. 100, 140, and 240 micron Solar elongation angle = 90 deg Maps - Thermal emission from relatively cool interstellar dust warmed by stars in the Milky Way dominates at these wavelengths. At high Galactic latitudes, interstellar "cirrus" clouds are apparent. Emission from the solar system dust ("zodiacal emission") is strongest at 25 microns but remains in evidence in the 100 micron image, and to a lesser degree at the longer wavelengths. All of the Solar elongation angle = 90 deg Maps are shown with logarithmic intensity scales. The following table gives the minimum and maximum log(I) for each DIRBE photometric band. The zodiacal and Galactic emission must be precisely modeled and subtracted in order to detect the relatively faint Cosmic Infrared Background which the DIRBE was designed to find. Secondary DIRBE objectives include studies of these astrophysical foreground components. Annual Average Maps at 3.5, 25, 100, and 240 microns - Galactic coordinate Mollweide projection maps of the entire sky at four wavelengths showing emission from stars and dust in the Galactic plane (horizontal feature) and light scattered and emitted by dust in the solar system (S-shape). 1.25, 2.2, 3.5 micron composite image of Galactic center region - shows asymmetric shape of the bulge at the center of the Milky Way. The image is a Mollweide projection covering 60 deg in Galactic longitude by 20 deg in Galactic latitude and centered on the Galactic center. A similar near-infrared image of the entire Galactic plane is available (with zooming and panning features) on the Multiwavelength Milky Way page. 100 micron Weekly Sky Maps for mission weeks 4 to 44, plus Annual Average Map - shows sky coverage each week of the DIRBE mission over the period during which the COBE cryogen supply lasted. As the Earth, with COBE in orbit, revolved around the Sun, DIRBE viewed the sky from an ever-changing vantage point in the solar system, enabling light reflected and emitted by the interplanetary dust cloud to be modeled. DIRBE scan track superposed on 100 micron Annual Average Map and 100 micron intensity from the corresponding segment of Time-ordered Data - DIRBE scanned the sky in a helical pattern that resulted from the spin and orbital motion of the COBE satellite and the "look direction" of the telescope, which was 30 degrees from the spin axis. The scan segment depicted covers two COBE spin cycles, or about 150 seconds, during a time when the DIRBE field of view swept through the Sco-Oph region (bright area above the Galactic center in the figure) and passed near the North Galactic Pole, where the emission is faint. The brightness of the sky at 100 microns measured during this interval is shown as a graph of intensity vs. time, as given in the DIRBE Time-ordered Data product. On the abscissa, the unit of time is 1/8th of a second. A related gif image shows intensity vs. time at four wavelengths - 3.5, 25, 100, and 240 microns - during the same period. Zodiacal emission is evident at 25 and 100 microns; the bumps at about 470 and 1040 time units correspond to ecliptic plane crossings. Stars give rise to the spikes seen at 3.5 microns. The signal-to-noise ratio is clearly worse at 240 microns than at the other wavelengths. The following two figures were provided by Dr. Henry T. Freudenreich and are described in his paper on The Shape and Color of the Galactic Disk ( 1996, ApJ, 468, 663). The Galactic plane runs horizontally through each figure. The Galactic center lies along the 0 degree meridian and the anti-center direction appears near the left side of each map. The 90 degree meridian is labeled for scale. 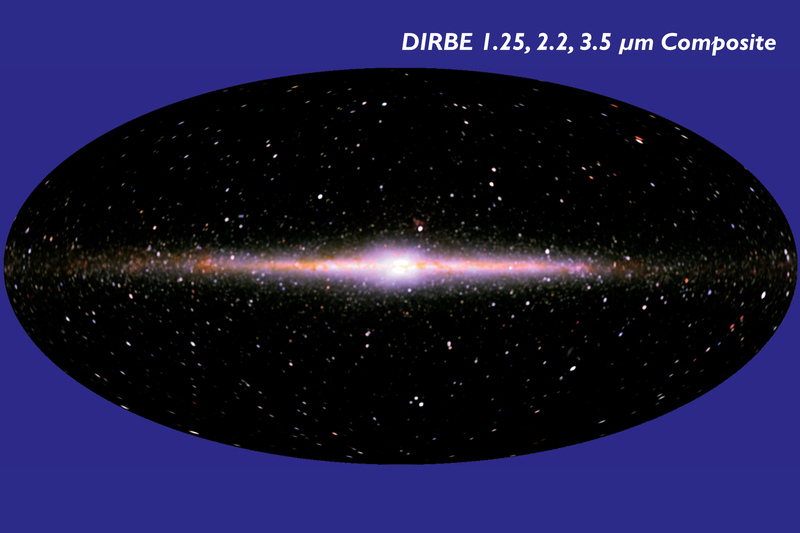 Top: A sky map of the ratio of the surface brightness in the DIRBE J band (1.25 µm) to the surface brightness in the DIRBE K band (2.2 µm), after the zodiacal light has been subtracted. The range is 0.8 to 1.4. Starlight dominates the sky brightness at these wavelengths. The darker areas in this image exhibit the light scattering and absorbing effects of interstellar dust; those effects are greater at shorter wavelengths. Bottom: The surface brightness at 240 µm. At this wavelength, in the far-infrared, stars are invisible and we see thermal emission from dust heated by starlight. The range of surface brightness is 0 to 115 MJy/sr. This map is bright where the top map is dark because the same interstellar dust clouds that absorb background starlight at near-infrared wavelengths are warmed by this absorption to about 20 degrees Kelvin, making them sources of far-infrared emission. Top: A sky map of the ratio of the surface brightness in the DIRBE K band (2.2 µm) to the surface brightness in the DIRBE L band (3.5 µm), after the zodiacal light has been subtracted. The range is 1.5 to 2.1. This map is darker where there is more dust along the line of sight, like the J-K map, but it also shows filamentary structure absent from the J-K map, a sign of dust emission at 3.5 µm, which requires a temperature of nearly 1000 Kelvins. An ultraviolet photon could heat a large molecule (e.g., a polycyclic aromatic hydrocarbon, or PAH), or a very small dust grain to such a temperature. Bottom: The surface brightness at 240 µm multiplied by the sine of the Galactic latitude. This procedure accentuates the relatively nearby interstellar clouds, such as the molecular clouds in Orion (lower far left), Taurus (to the right of Orion) and Ophiuchus (above Galactic center). When scaled by the sine of latitude, the map intensity ranges from 0 to 13 MJy/sr. Comparison of this map to the K-L map shows that regions containing cool dust tend to coincide with regions containing hot, small dust grains. The molecules or tiny grains seem to be a general component of the interstellar dust.